Today, Jeannie begins a brand new series on the Bible, so this would be a good time to subscribe and download so as not to miss any of the episodes. How are we to understand words like "inspired" and "inerrant" when it comes to the Holy Scriptures? Jeannie is in Genesis chapter 2 but begins with a listener's question that is probably representative of many other listeners as well. Dr. Constantinou continues her series on Exodus, this time explicating the story of the Ten Commandments. 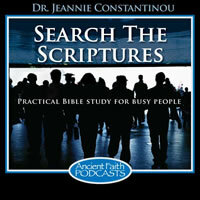 Dr. Constantinou discusses David. This is lesson 92 in her series, "Introduction to the Bible." Dr. Constantinou takes us through some of the many patristic statements about the prophet Jeremiah.